​From Wednesday May 22nd to May 24th, California Welding Institute will be hosting an AWS CWI Part B class, led by an AWS Instructor. The exam will take place following this class, on Saturday May 25th. ​From Sunday February 10th, to Friday February 15th, the AWS 40 hrs CWI Seminar was held at California Welding Institute. AWS Instructor Rick Suria lead this week-long seminar to prepare candidates for the CWI Exam. The CWI Exam took place following the seminar, on Saturday February 16th. ​On Saturday February 2nd, 2019, the Los Angeles/Inland Empire Section hosted an " Intro to MIG Welding Workshop" at California Welding Institute led by Samantha Farr, founder of Women Who Weld. This half day workshop was designed to introduce women to welding. Proceeds benefited Women Who Weld's subsidized welding training program for unemployed and underemployed women in Detroit, Michigan. The workshop was made possible by donations from industry partners: California Welding Institute donated gas, steel and the use of the facility and their instructors helped during the workshop; Fronius donated the use of welding equipment and their representatives helped during the workshop, Westchester donated welding gear, Tillman Co. donated welding gloves, Airgas and Cameron Welding Supply donated wire. The L.A/I.E Section sincerely thanks all industry partners for the contributions - this workshop would've not been possible without them. Our instructors attended North America's Largest Metal Forming, Fabricating, Welding and Finishing Event in Atlanta. This included attending meetings from the American Welding Society (AWS), such as the Education Committee meeting, AWS Board of Directors meeting, AWS D17.1 Technical Committee Meeting, AWS Foundation meeting, walking the floor to get educated on the latest technologies and the future of welding and manufacturing, and getting together with AWS Section Officers, District Directors, and other volunteers. Arc Machines, Inc., founded in 1976, designs, manufactures and distributes the world’s broadest and most advanced range of automated orbital welding equipment. AMI specializes in the design and manufacture of precision, highly automated, stable welding systems including welding power sources, control systems, electro-mechanical torch manipulation devices (weld heads) and arc-zone vision systems. AMI’s equipment is used in a wide variety of industries, including Aerospace, Semiconductor, Pharmaceutical/Biotechnology, Nuclear Power Generation, Shipbuilding, Defense, Oil/Gas Installations, Petrochemical, Fossil, Food/Dairy/Beverage, Brewery, Pulp/Paper, Offshore, Vessel, Manufacturing, Wastewater Treatment, Heat Exchanger Manufacturing. Come try out AMI's Orbital Welders and Orbital Weld your own shot glass! Enjoy a Street Tacos Dinner provided by AMI to all guests ! Raffle tickets $1 each. Bring lots of dollar bills! ​Join the FUN !!! Bring your friends, family and colleagues !!! Please RSVP to aws_laie_section@msn.com (head count for food), but come no matter what! 1) Our Welding Instructors George Rolla & Mariana Ludmer were invited to speak. They will be presenting on common errors found in weld details and will be providing an overview of welding symbols and AWS D1.1 Structural Welding Code - Steel. 4) Greg Brawley from PDC Asia Pacific will be presenting on a new look at old issues. The conference will end with the President's Banquet. On Saturday March 10th, our Section hosted a Careers in Welding presentation coupled with an Intro to MIG Welding Workshop for women, led by Samantha Farr from Women Who Weld. A few years ago, Samantha started the non-profit Women Who Weld in Michigan to help underemployed women to launch careers in welding. Through fundraising campaigns, she is able to offer free training to women who desperately need a career. Samantha works with local employers in Michigan to help her program graduates find work as welders in local manufacturing plants and shops. She is successfully changing many lives through hard work and dedication. Her endeavor takes her to many places around the country where she offers one day workshops to introduce women to welding. Through this fundraising campaign, she is exposing women to welding, encouraging them to explore career opportunities that normally women would not consider or even be aware of its existence. Samantha’s efforts are aligned with the AWS’ efforts to bring more women into the field. As a women in welding, Section Chairman and Operations Manager at the California Welding Institute, I was thrilled to learn about Samantha’s efforts and offered our Section’s support. Our industry partners, Temescal Canyon High School, Fronius, Action Gas & Welding Supply, California Welding Institute, Westchester and National Standard made it possible for this event to happen. Fronius provided the welding equipment, which included three MIG machines, one Stick and one TIG; Westchester provided welding gear and National Standard (a women owned corporation) the welding wire. Temescal Canyon HS and Action Gas & Welding Supply provided material and gloves. In the morning, we opened the doors to the public, offering three rounds of presentations about careers in welding. In spite of rain, we had about 20 attendees, many of whom were young women. At noon, Samantha kicked off the workshop with a presentation about her organization and her welding career. Then, Fronius representative Jose Arellano showed us how to use state-of-the-art Fronius equipment, and Samantha led the workshop. Originally, the plan was to teach women how to weld using GMAW (MIG); however, Fronius graciously provided an arc welder and a TIG welder as well, so women had a chance to weld with all three processes, which made the event even more exciting. Our Section’s Technical Representative, George Rolla, SCWI and expert welder of 43 years, provided support. He worked with Jose Arellano to set up the Fronius machines and get them dialed in for the workshop. George describes the Fronius equipment as truly out of the ordinary welding machines, surpassing every expectation a welder could have. The MIG welders are so versatile, with an absolutely incredible stable arc, performing like nothing that George has ever seen in the 43 years he’s been welding. Coupled with National Standard’s high end welding wire, the Fronius Transsteel MIG machines welded like a dream. The Fronius TIG Welder was small in size but performed like a giant, even running on a battery pack that can be plugged in and charged during use when power is available. It produces a super smooth arc, with incredibly precise pulsing, not only producing an aesthetically good looking weld, but one that would produce high quality welds, surely to meet the acceptance criteria of any welding code, including Aerospace. Couple this welding machine with the latest TIG welding gloves from Westchester and you are set for success! The portable Fronius arc welder that worked on 115V power was able to burn a hot E6010 1/8” electrode better than most larger inverters George has welded with. Welding with E7018 1/8” electrode at 130 Amps was absolutely no problem and all the women welders restlessly welded non stop with this machine, never exceeding its duty cycle. It just kept going and going. If any of these welding machines were a car, they would be a Lamborghini that can be purchased for the price of a Camaro. George highly recommends individual welders and shops to venture into a new world, the world of Fronius welding equipment.Their electronics are far superior than their counterparts. The women who attended the workshop ranged in ages and experience in welding. They all were thrilled to partake in this learning experience and contribute to Women Who Weld’s efforts to bring in more women into welding. The afternoon started as a serious venture and by the end they were all laughing and having fun, turning it into a great social event as well. Subject: WHAT’S YOUR WELDING CHALLENGE? Consistent spatter free welds on Stainless Steel? High Speed MIG welds on Ultra-Thin gauge material ? Aluminum welding on a ship’s hull? There are virtually unlimited challenges encountered while welding – and you must surely have a difficult task or two. Come join us at our next Section Meeting at Fronius. Our host will address your challenges, have demos, food and let you try out their latest technology! Live robotic and manual welding demos. Share your welding challenge with Fronius via email to Rowntree.Tim@fronius.com by January 31st. . Two entries will be chosen for Fronius to present a solution to at the meeting. Describe your challenge in as much detail as possible. You can also attach photos, drawings, diagrams and videos if you wish. Who is Fronius? A company who loves to inspire customers with innovative solutions. In a world continuing to grow with technology in mind, Fronius feels this step-forward and their value driven approach in leadership sets them apart from competitors, and helps to build a foundation for lasting and sustainable advancements. Fronius is a company in which community is key: they value each other as much as the products they produce. Even though they are a part of a much larger global community, Fronius USA holds strong as a key player and collaborative leader. And, most importantly, they are a strong supporter of AWS and our Section. Fronius and the Perfect Welding Business Unit have been developing welding technologies and system solutions for arc welding and resistance spot welding since 1950 and have pushed forward the rate of progress in the welding technology sector in leaps and bounds. Today they are the global technology leader in the arc welding technology segment. With innovative developments they have made applications possible that others had written off as unachievable, such as the thermal joining of steel and aluminum. The range of products offered by the Perfect Welding Business Unit includes manual and automatic power sources and complete systems as well as the related services. And as always… FREE DINNER and our famous 50/50 Cash Raffle! Plus, many other incredible prizes graciously donated by our Section Sponsor! Join us in welcoming Efram Abrams from AWS Headquarters in Miami ! Come join us for a free dinner, get a chance to win welding gear, helmets, shirts, goodies, and cash at our usually 50/50 cash raffle! At this meeting, we will do a tour of Santa Ana College’s welding facility and Efram Abrams will talk about AWS Educational Programs available to everyone: companies, educational institutions, educators, inspectors, and students. Located on the upper and lower level of the mall, visit over 200 colleges, universities and trade school and speak with counselors and advisors about what their school has to offer. Buffet Dinner: $5 CWI Publications Auction!!! Guest Speaker: Anne and Mark Denney from Bradford Derustit Corp.
Join us for a Gourmet Buffet Dinner! Anne and Mark Denney from Bradford Derustit Corp. are going to discuss stainless steel applications, preservation, restoration and protection techniques. Stainless is found everywhere. It is known for being corrosion resistant. However, that does not mean it will not rust. There are hundreds of applications where stainless steel is used. At some point in a welder’s career, they will have a situation where stainless steel is required. It is important to understand the basic properties of stainless steel. Protecting, restoring and preserving stainless steel is an ongoing challenge for all industries. Join us for a presentation from Bradford Derustit Corp. With over 50 years of experience, Anne and Mark Denney will share their knowledge on using stainless steel. How to maintain the corrosion resistance properties, something everyone should know that welds stainless steel. Plus, enter for a chance to win at our famous 50/50 cash raffle! And, as a Section Fundraiser we will also be auctioning a complete set of CWI publications. The auction will close at the meeting and we will announce the winner at the meeting. You have to be present to receive the books. RSVP to aws_laie_section@msn.com but come no matter what! ​This program will demonstrate how recent structural steel industry innovations allow architects to easily express their design, concepts, overcome client serviceability and safety concerns, enhance their use of architecturally exposed structural steel, and help ensure a comfortable, safe and sustainable building environment for occupants. Registration is limited to 20 persons, with priority given to members of the AIA Orange County Chapter. Please register and we will make every attempt to accommodate your attendance! About Your HostAIA Orange County (AIAOC), a Chapter of The American Institute of Architects, was established in 1952 by 18 members. It is a tribute to the dynamic growth of this unique area that this chapter is now the third largest chapter in the State of California with over 800 members. Our first Chapter Office and Home was in the Balboa Pavilion. Guest Speaker: George Rolla, SCWI, CWE, CW and President of Advanced Weldtec, Inc.
Summary: Mr. Rolla will share with us how to become an L.A City Certified Welder, L.A City Approved Fabricator, and L.A City Deputy Inspector. He has helped many companies to become Approved Fabricators, welders to become L.A City certified and inspectors to get the Deputy Inspector certification. He knows the ins and outs of these City programs and will share his knowledge and experience with us over dinner. 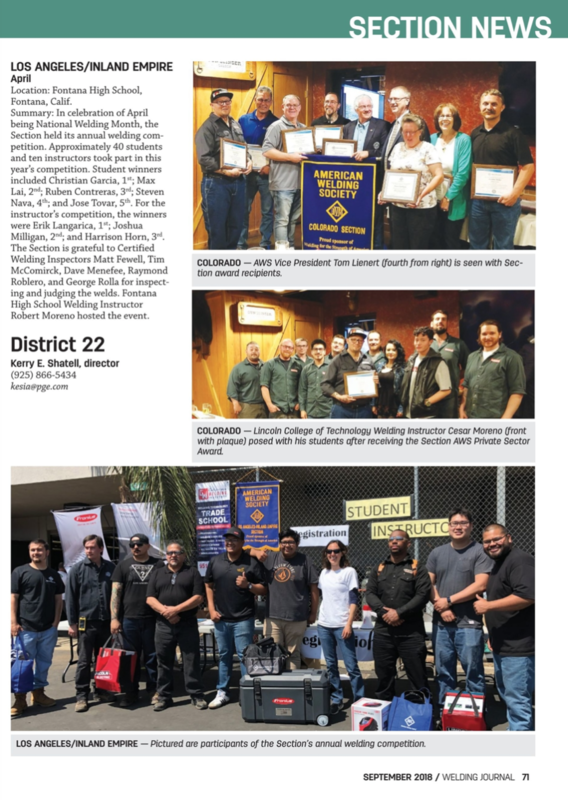 Summary: Advanced Weldtec, Inc hosted the AWS Los Angeles/Inland Empire Section's annual Student and Professional Welding Competition and Career Fair! Take a look at the August edition of the Welding Journal for a detailed story of a successful event and photos.